Build Quality (9/10): The D1100 is fairly large for a portable headphone but remains lightweight due to the plastic and aluminum construction. Aluminum is used in the headband and earcups while the forks and trim are plastic. The D1100 does fold flat and the dual-sided cable is thick and sturdy but it somehow looks and feels less portable than the older D1001k and its sibling, the Creative Aurvana Live!. Still, the construction is very solid and the headphones feel anything but cheap. A very long extension cable and soft carrying pouch are included. Comfort (9/10): The cups of the D1100 are fully circumaural, some of the deepest I’ve seen on a portable headphone. The pads are plush and very well-made and the moderate clamping force keeps the headphones well-sealed. Heat is an issue for moderate to long listening sessions as the cups are not vented. The wide ‘shoulders’ of the headphones and relatively large size may look strange in portable applications. Isolation (8.5/10): The thick pleather pads and adjustable structure of the D1100 provide impressive isolation, easily on par with most of the DJ headphones in this lineup. Sound (8.25/10): There is no getting around it – the D1100 is one for the bassheads. The low end is extremely powerful, enhanced not in depth – which is about average – but in impact and relative emphasis. The bass is on the boomy side, fat and hard-hitting. It remains strong quite high up, above the range occupied by the typical mid-range hump. Many would undoubtedly prefer extra bottom-end extension to such strong upper bass but it is what it is, at least without EQ. It sounds a bit loose next to fast-and-tight sets such as the ATH-ES10, Beyerdynamic DT1350, and Sennheiser HD25-1, all of which are faster and slightly more resolving than the Denons. The bass of the D1100 is not slow but it is heavy enough to be ever-present, sometimes intrusive. It can fatigue, even annoy those who prefer more balanced sound. That said, out of the similarly-priced portables I have on hand only the Klipsch Image One can match the D1100 in bass quantity, but it does so at the expense of speed and clarity. For the discerning basshead, then, the Denons may just be at the top of their game. Surprisingly, the bass does not bleed up into the midrange too much – enough to give the midrange a characteristic warmth but not so much as to heavily affect the clarity. The midrange still sounds clear, detailed, and reasonably open. It has a smooth, liquid character to it but lacks the veiled warmth and sub-par resolution of the similarly-bassy Image One. In terms of emphasis, the mids sound recessed due to the dominant low end but are not distant in the overall soundscape. The Sennheiser HD25, which undoubtedly has better bass-midrange balance, still fails to sound as intimate as the D1100 can. Part of it comes down the more enveloping soundstage of the D1100 but part of it is due to the mids simply being more lush and full than those of the HD25 and other studio-oriented headphones. The top end of the Denons is balanced well with the midrange and sufficiently present despite some roll-off at the very top. There is a bit of sparkle at the expense of some smoothness compared to something like the V-Moda M-80 and Phiaton MS400 but all in all the top end isn’t really noteworthy – not full of air and energy a-la HD25-1 and ATH-ES10 and not purposely non-fatiguing like that of the M-80. Tonally, that causes the D1100 to fall slightly on the dark side of neutral – not quite as much as the Klipsch Image One but clearly darker than the HD25 and AKG’s Q460. The presentation of the D1100 is fairly big, giving more front-to-rear and top-to-bottom space than the majority of portable headphones. The sonic space is deeper than it is wide, however, causing the layering to sound exaggerated and the overall sound to be somewhat cavernous. While the depth of the sound and the separation are very good, the derived sonic image isn’t as convincing as with some of the more conventional portables despite the superior layering. Not a great set for pinpoint accuracy, but those seeking a more cinematic experience will probably like the presentation. 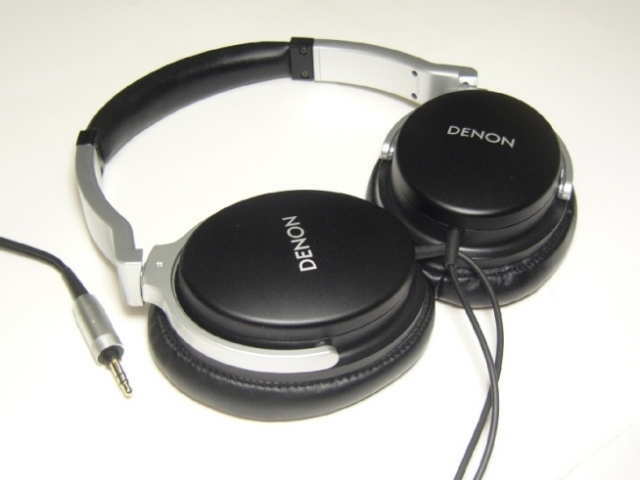 Value (8/10): The Denon AH-D1100 is a fully circumaural portable headphone that follows in the footsteps of the older Denon AH-D1001k/Creative Aurvana Live!. Happily, the construction is far more heavy-duty than that of the CAL! and the headphones have made gains in portability and isolation with the new flat-folding design, harder-clamping headband arms, and thicker imitation leather pads. The headphone also remains lightweight and comfortable aside from a tendency to heat up over time. The sound, however, takes a step into basshead heaven even when compared to the already consumer-friendly warm character of the older model. There are sets with deeper bass out there but the D1100 impresses with its punch and power. The low end can be intrusive, even annoying, and analytical listeners will not appreciate it but the D1100 does a good enough job keeping it all coherent and reasonably controlled. It’s an easy one to recommend for bass lovers looking for a go-anywhere near-full-size headphone. I think you should downgrade the build-quality. On amazon a lot of people complain that the plastic parts break. There’s even a 3D model made so you can replace the parts yourself. Since their support won’t repair it for you. Joker are these good for $80? That’s how much they are now. I like the simple design of these, not too gaudy. I have m50x right now but mids (male voices) are a little too lean and sorta artificial sounding and the female voices are really loud, can get fatiguing. The rest of the sound is great. I listen mainly to hip hop and all the modern pop hits -Tswift, Gwen Stefani, Katy Perry(and I say that enthusiastically). So something bassy is fine yet with smoother voices and more full or as you brilliantly put it “lush”. Coming from an M50X these will sound very bassy and not very clear. They will give you a slightly more full-bodied sound, but I don’t think the tradeoff is worth it. You’d be better off looking around for the older generation of these (D1001k) or a 1st-gen Creative Aurvana Live (which was a 1001k rebrand) – they’ll still give you a warm, full sound that will nicely compliment the M50X, but are not as extreme in the bass department as the D1100.